The Birmingham Sea Life Centre is fabulous. 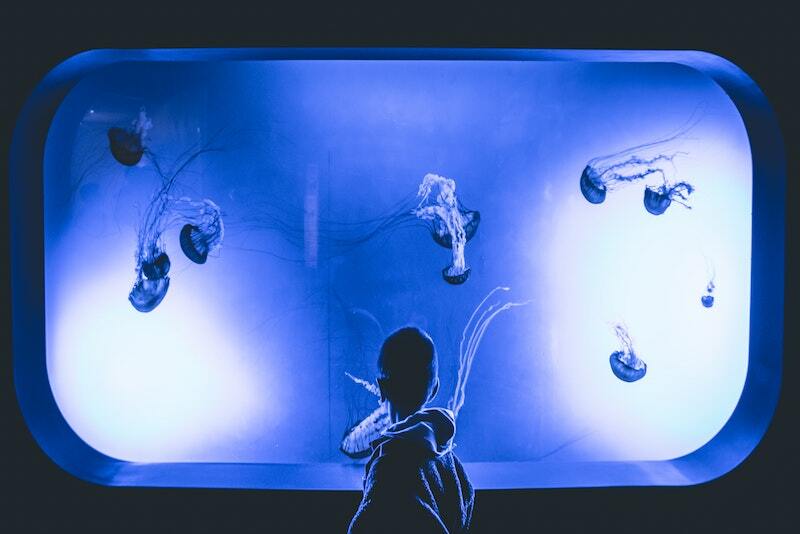 It takes visitors on a twisting uphill path through a vast, open main space and into darkened rooms with a range of different underwater species. My twin boys, just over two at the time, were loving it. The colours, lights and movements enchanted them and they couldn’t move quickly enough between the exhibits. When we got to the top of the path we queued for the Octonauts 4D film. I was distracted for a moment, and then turned to find one of my children was gone. I stepped out of the queue and looked in each direction, taking a few steps. I walked a little further and asked an employee if she had seen a small boy. She said no. My husband and I have had the conversation several times now about what to do should we ever get into the situation again, and we’ve agreed that we should have immediately asked an employee to radio other staff members and spread the word quickly. But at the time, it didn’t seem necessary. I kept thinking he would be right around the next corner, nose pressed against the window to the otter exhibit, or watching the sharks in their graceful circuits around their tank. I ran back the other way, into the darkened room of piranhas, where the only way out was a lift down. By this time, my husband had joined me, leaving our other child with a helpful family, and we were running through the darkness, shouting our baby’s name, becoming more and more hysterical. Finally, as a feeling of sickness churned in my stomach, a man asked if I was missing a little boy in a red jumper. When I answered yes, he pointed me in the right direction and I ran back down the twisting path, further than I thought my little boy could have ever gone on his own, and around a corner where I saw him, hidden by trees, staring mesmerised at a pool of fish. He turned to me, smiled delightedly, pointed at the water and announced, ‘Fish!’ He was utterly oblivious to my distress and looked at me with confusion when I swept him into my arms and burst into tears. My children have come up with a thousand ways to make me panic. I regularly worry about fingers getting smashed in doors, heads bumped during wrestling matches, and broken limbs sustained through enthusiastic jumping on whatever they have decided is their new ‘bouncy castle’. Parenting is not for the faint-hearted. But nothing has given me the same sense of total helplessness as turning around and realising my child was gone. And the worst part is that it will probably happen again. They will test boundaries and see how far they can go, and I will do my best to keep up, hoping I’ve taught them not to go that bit too far. You can read more from Rebecca on This Twin Life and follow her on Twitter and Instagram. Rebecca is an American living in England. A mother of twin boys, she used to enjoy baking and gigs but now spends most of her time singing nursery rhymes and answering the same damn questions from strangers over and over again. She is a part-time secondary school English teacher. You can read more from Rebecca at https://thistwinlife.blog and follow her on Instagram at this_twin_life.